On November 10th, the same day fast food workers and other low wage workers around the country staged strikes and actions calling for $15 and a union, New York State’s Governor Cuomo announced an executive action that would guarantee that all state workers would receive a minimum of $15 an hour as a minimum wage. This precedent-setting victory makes New York the first state to set such a high wage for its public employees. The victory comes on the heels of other New York victories being driven by low-wage worker organizing, spearheaded by core CPD partners New York Communities for Change and Make the Road New York and allies SEIU 32BJ, National Employment Law Project, Citizen Action, the Labor-Religion Coalition of New York State, the Alliance for a Greater New York (ALIGN), and the Strong Economy for All Coalition, among others. With Cuomo’s executive order, In New York City, state workers will earn $15 an hour by the end of 2018 and, outside of the city, state workers will see wages rise to $15/hour by the end of 2021. All told, some 10,000 workers will see an increase in their wages. 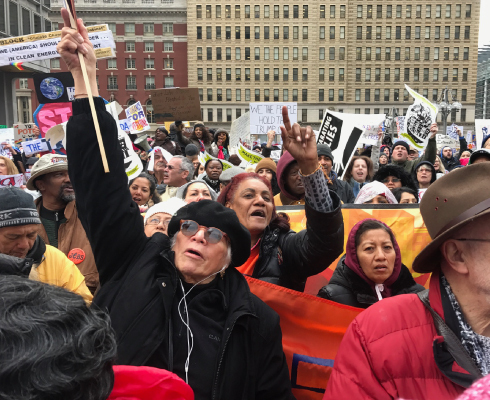 Since early 2015, large scale low wage worker mobilizations have helped obtain a 50% increase in NY State’s tipped minimum wage and a $15 minimum wage for fast food workers. The current focus of the “Fight for $15” campaign is a pending bill to raise the state-wide minimum wage to $15 per hour for all New York workers.